The model 7926 holds Streamlight Stinger, Streamlight Stinger XT, Streamlight Poly Stinger and similar flashlights. For use with belts up to 2.25" wide. Works good light fits good. Fits the light perfectly, seems well constructed. Holds my light way better than the closed cases. This fits my Stinger DS LED perfectly. I like the position it holds the flashlight in (how high it sits in the holder) I can move around without worrying about the flashlight falling out. Great looking, light weight, and durable. I'd probably go with a covered holster next time. My flashlight holds but it will slip out from time to time. Holder is great, works perfectly. Fits my Streamlight Scorpion perfectly. Does What its supposed to, and the quality appears to be fine. No issues so far. Exactly as described. Holds Stinger DS very snug. Great product. Perfect fit for my Streamlight Stinger DS LED. Exactly what I was looking for. Easy to get my light in and out of it. Provides a much more professional appearance to the street uniform officer than nylon. Holds the stinger flashlight securely and looks good doing it. Seems well built and I think it will last a very long time. Does this holder fit a Streamlight poly-stinger (#75455)? The model 7926 holds Streamlight Stinger, Streamlight Stinger XT, Streamlight Poly Stinger and similar flashlights. Will this product fit a Stinger DS LED HL, length 8.85"? This holster fits about 1" diameter and similar. The HL is a little too big. 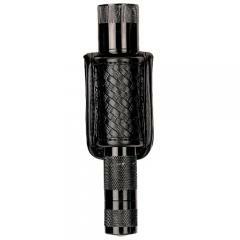 The "Streamlight Nylon Loop Holder for Stinger Series Flashlight" is the closest fit that will work. Will this holder fit the Streamlight Stinger LED DS C4 model number 75812?